Want to know more about how one of our services? At WEGO, we are passionate about protecting the environment and committed to being carbon neutral. Our aim is to provide expert, sustainable and cost-effective delivery solutions. Established in 1998, WEGO are experts in ‘green’ logistics. 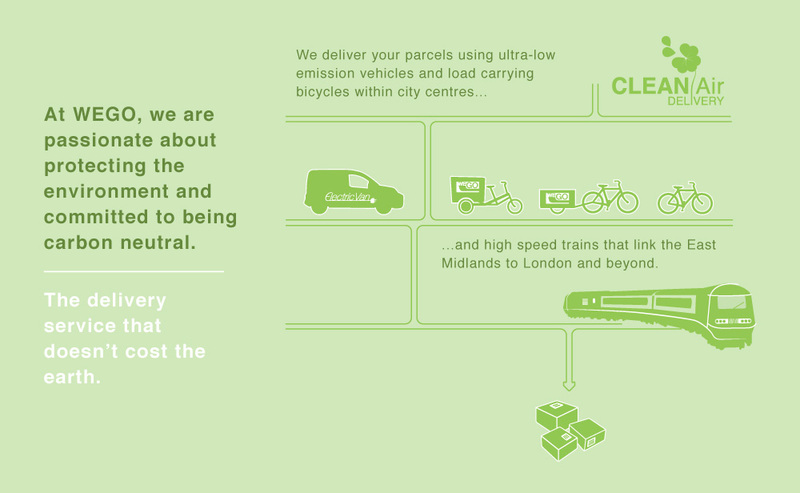 We deliver consignments using ultra-low emission vehicles and load carrying bicycles within city centres. This CLEAN Air DELIVERY service is better for the air quality of our cities and everyone’s health. Our bicycles also mean we can access the increasing number of pedestrianised areas, meaning WE GO where others can’t. WEGO can also deliver your documents, parcels, and bulky items nationwide. 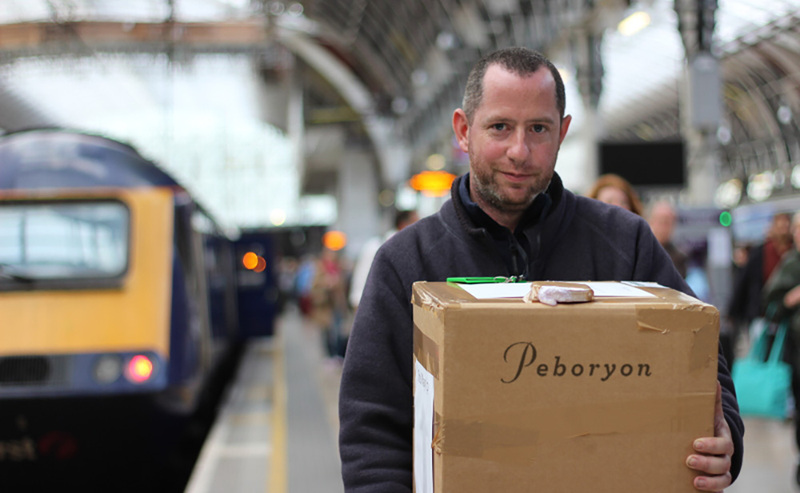 We utilise secure compartments on high speed scheduled passenger trains between key UK cities to provide innovative same day and next day deliveries that are faster and greener than existing road based couriers. 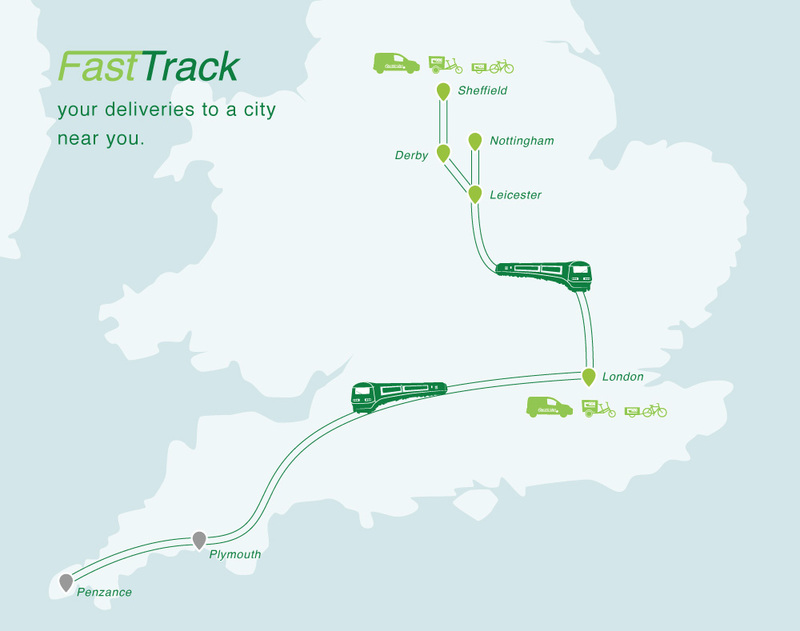 This FastTrack service, in partnership with InterCity RailFreight, is currently unique in the UK and delivers to and from London and other UK cities. Why not call to get a quote for your local or national delivery? You won’t have to deal with a busy call centre – just dial 0800 772 0100 to speak to a member of our friendly team. 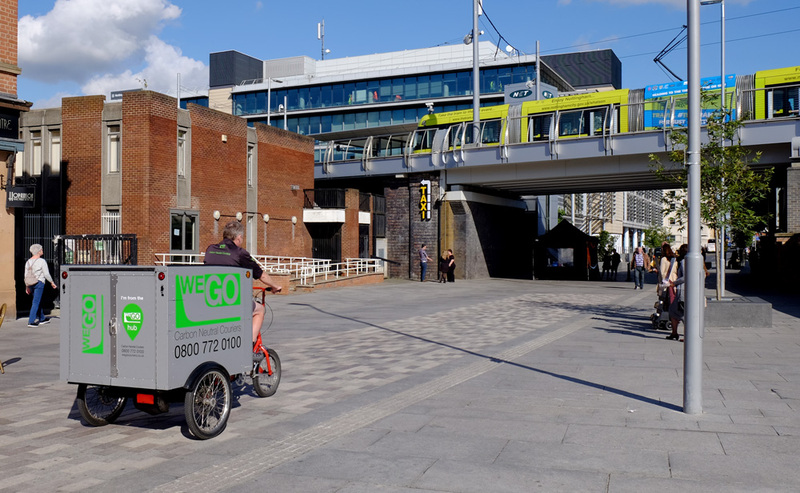 WEGO Couriers transport goods using secure compartments on scheduled passenger trains, combined with CLEAN Air DELIVERY vehicles for the last mile in select UK cities. FastTrack is a unique courier and delivery service providing premium same day and overnight delivery solutions to benefit both you and your clients. Choose FastTrack and be part of a delivery revolution, helping to reduce air pollution and to ease traffic congestion on the motorways and in city centres. For example, if you need to make a delivery to London, you can drop off your consignments at a WEGO Parcel Hub in Nottingham, Leicester or Sheffield then we can deliver them on your behalf, via train and CLEAN Air DELIVERY vehicles straight into the heart of the capital at a very competitive price. What’s more this award-winning service is proven to be FAST, FREQUENT, RELIABLE, and COST-EFFECTIVE. We offer bespoke delivery services to meet your requirements. These include expert handling of clinical and biological samples, gourmet and artisan items, as well as goods requiring temperature controlled options or specialist bio-hazard training. Let the train take the strain and FastTrack your time critical parcels and documents. Our dependable couriers are renowned for transporting documents and parcels between sites across city centres, reliably collecting and delivering at an agreed time. We undertake regular deliveries for a range of sectors including legal, medical, engineering, public services and the Arts. Our couriers can collect from your DX box and Royal Mail sorting office on your behalf, and deliver your mail at a time to suit you. At the end of each working day, we can collect your post and deliver to your local sorting office too. We are specialists in multi-drop deliveries and can safely and accurately deliver a wide range of consignments, including letters, documents and parcels, to both domestic and commercial destinations on your behalf. WEGO Couriers offer a range of dedicated Medical Courier Services, based on a wealth of experience. 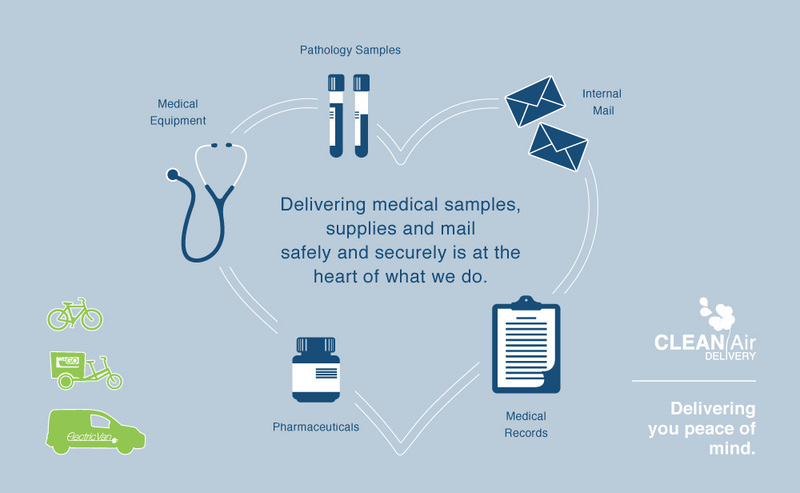 Whether you require the transportation of pathology samples, records and internal mail, the delivery of prescriptions, or general courier services between sites, WEGO offer safe and reliable solutions to meet your needs. 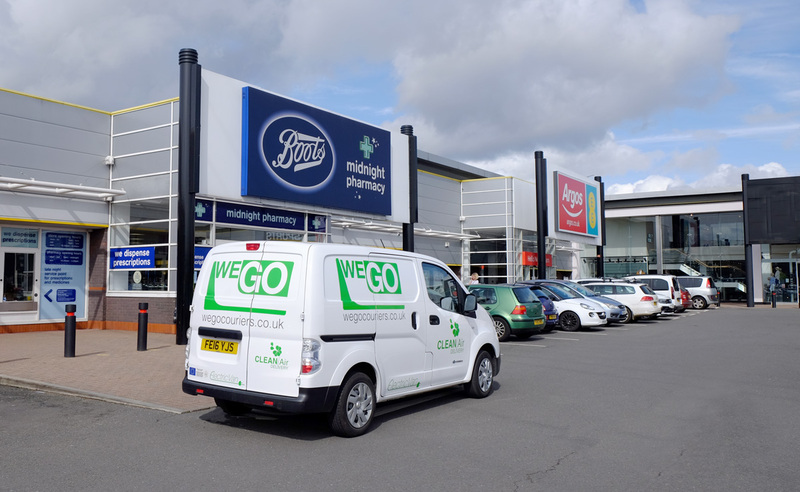 Utilising dedicated vehicles and GMP Compliant drivers, WEGO consolidate deliveries between hospitals, GP surgeries, pharmacies, care homes and private residences to offer solutions that are cost-effective and secure. WEGO fulfil daily library rounds, ensuring the efficient movement of books around the libraries of Nottingham. 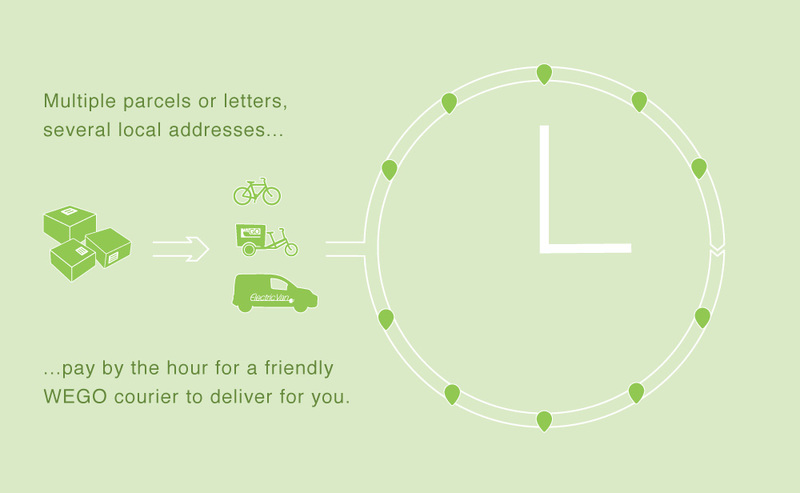 Need to deliver multiple parcels or letters to several local addresses? Why not hire a WEGO courier to help meet your commitments? You can pay an hourly rate for a service that is both reliable and cost-effective. Our friendly and professional couriers can transport your consignments using ultra-low emission vehicles, whilst you rest assured that they have the expert knowledge required to ensure that everything arrives safely and on time. WEGO couriers are fully trained to handle clinical and biological samples, gourmet and artisan items, as well as goods requiring temperature controlled options or specialist bio-hazard training. We are specialists in multi-drop deliveries, so can accurately deliver a range of parcels on your behalf to both domestic and commercial destinations. Whether you are looking to hire a courier for a one off job, on a regular basis, or to cover for your staffs’ holiday or sickness call us on 0800 772 0100, or email us at info@wegocouriers.co.uk, to find out how we can help when you need that extra bit of support. WEGO are your local last mile delivery experts. 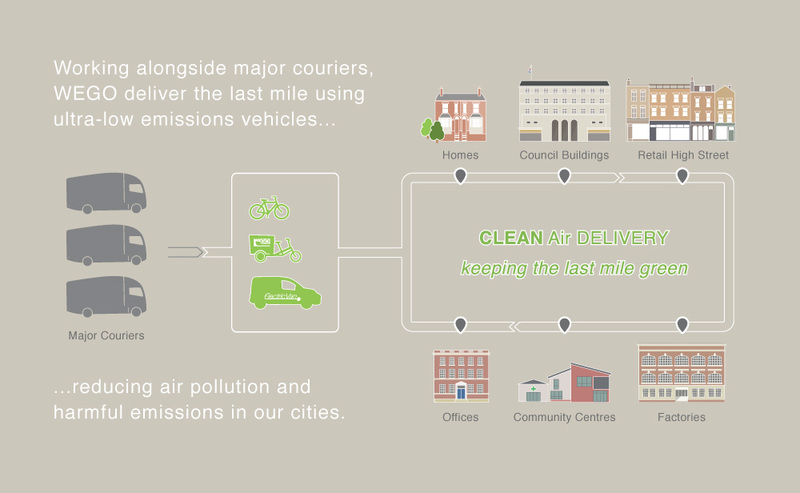 We use zero-tailpipe emission vehicles to provide a CLEAN Air DELIVERY service which is better for everyone’s health. Our electric vans and load-carrying bicycles mean fewer diesel trucks with their harmful emissions delivering in city centres, thus improving air quality. As our cities become more congested, WEGO provides a fast, multi-drop carbon neutral transport solution. Your items can be delivered to our WEGO Parcel Consolidation Hub and we will then deliver directly to your business using our ultra-low emission vehicles. If you are a shop owner with limited space, WEGO can act as your stockroom allowing you to call off items as and when required. You can then save costs on expensive prime rate shop space, as well as time and resources. Furthermore, WEGO can fulfil your customer orders too, delivering items directly to their door. Whether you need help with a regular delivery, an internal mail round or with your bank cheque runs, we can provide you with a safe and reliable pair of hands. WEGO work with leading couriers, such as TNT, to cover their last mile deliveries. 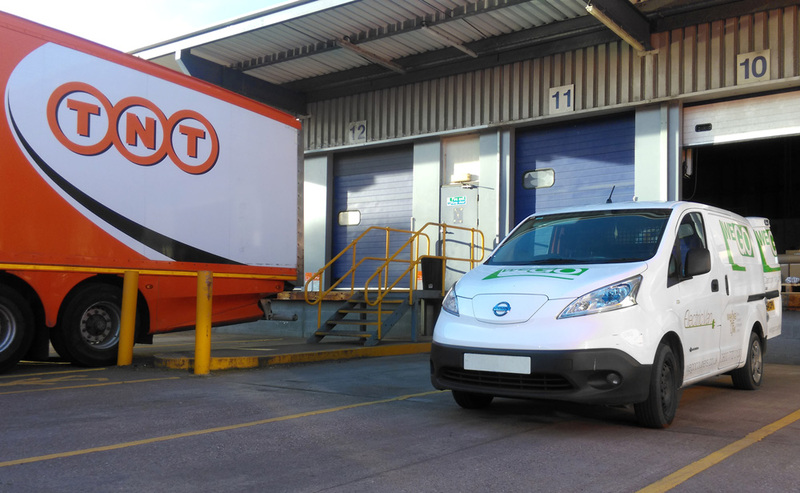 Our ultra-low emission vehicles collect consignments from the TNT Depot and deliver across the city centre. This helps to ease traffic congestion and provides a CLEAN Air DELIVERY alternative, making our cities safer and healthier places to live and work. WEGO Couriers are also proud to be part of THE REMOURBAN PROJECT, a Horizon2020 Project supported by the European Commission. Nottingham is one of three pilot cities chosen with a view to creating sustainable urban regeneration models. 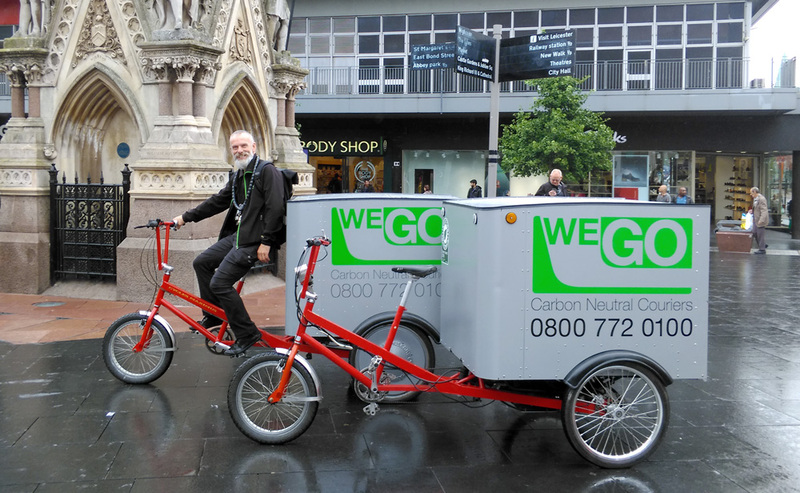 As contractors to Nottingham City Council, WEGO will be executing the last mile logistics aspect of the project, establishing a new, innovative zero carbon emissions delivery service to the Sneinton area of the city. It will provide a CLEAN Air DELIVERY service for businesses and individuals that will help to reduce harmful pollutants in the neighbourhood, thus protecting the environment and the health and well-being of local residents. Whatever city you are based in, call us today on 0800 772 0100 to find out how WEGO can help your business. Complete the form below and we’ll email you back with a quote, or call 0800 772 0100 to speak to one of our team.